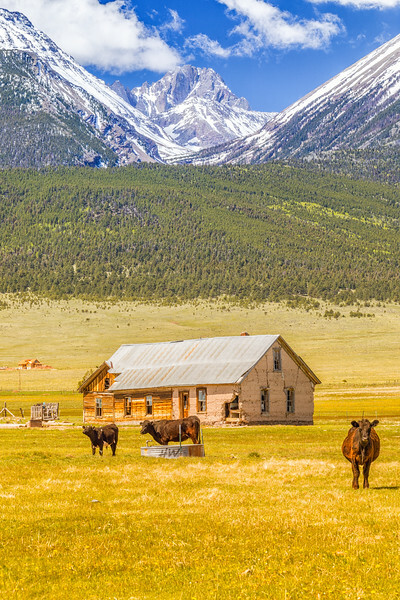 WESTCLIFFE — Bob Wire’s dream home sits behind the gates of The Eagles, a deed-restricted community of 20 nearly identical homes in southwest Custer County, in the shadow of Colorado’s Sangre de Cristo Mountains and in the heart of the Wet Mountain Valley. At 3,800 square feet, it has four bedrooms, a game room, a swimming pool and a driveway big enough for his Ford F-350. He moved in ten years ago. But, as time went on, there was a problem: the cows next door were not keeping up their home. On this day, at least, when asked "How now, brown cows? ", the cows had no comment. Nearly eight years, two judges, five lawyers and more than $100,000 later, there's still no resolution. A Circuit Court judge sided with the cows last year. The Eagles Master Association has now filed another appeal. "When we first moved here," Bob Wire says sadly, "we thought our beautiful home would be a cash cow. But now it seems we're left with nothing but cow chips." Shown here, Crestone Peak (elevation 14,294 ft / 4,357 m) is Colorado's seventh highest mountain. The image was made using a Canon EOS 5D Mark IV digital body, a Canon EF 180mm f/3.5L Macro USM lens, at f/16 for 1/25 second at 100 ISO. The raw image file was processed using Adobe Lightroom, Adobe Photoshop, and Nik Color Efex Pro 4.